Emmerich Knoll's winery in Unterloiben is one of Austria's most famous wine-growing estates. Each bottle’s traditional label is almost as highly regarded as the wines themselves. The Knoll estate is located in the village of Unterloiben in the wine-growing region Wachau. 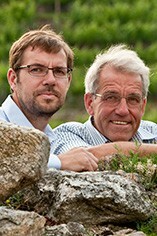 It has been run by the family for decades and today Emmerich II and Monika Knoll and their sons Emmerich III, who travelled far to acquire knowledge on his passion and august, who just finishend studies in agriculture are in charge of the 15 hectares of land where the famous grapes grow. Holdings of the estate can be found in top Wachau sites as Schuett, Loibenberg, Kellerberg, Kreutles and the kremstal vineyard Pfaffenberg. Over 45% of the vineyards are planted with each Grüner Veltliner and Riesling, the remaining 5% for Chardonnay, Gelber Muskateller, Rivaner, Gelber Traminer and Pinot Noir. Emmerich Knoll doesn't like overpowered, exuberant wines. Tight, concentrated wines which show their power packed - that's the credo of the ordinary estate. Knoll's wines are considered late bloomers beyond exception. 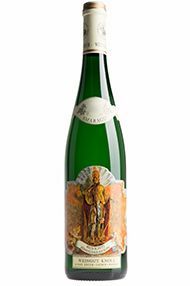 His Riesling Schütt is regarded a “primus inter pares” among wines of the Smaragd type and the range of sweet specialties which is produced whenever vintage conditions permit is equally excellent.The Kellerberg is one of the world's best individual terrains and bears, thanks to its special geological qualities, very exceptional wines. Emmerich constantly works meticulously to refine his products. This family-run estate in Unterloiben is one of the most renowned in the Wachau. Today Emmerich Knoll makes the wines, managing its 15 hectares of vineyards and the winery with his wife Anya, though his father is still involved in both those aspects of the business. The family’s wines will keep for decades. 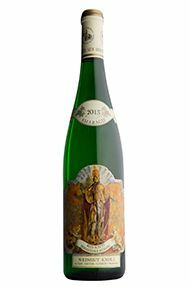 Ripe fruit with notes of orange blossom and fine, defining acidity characterise this classically proportioned Riesling from one of the Wachau’s top producers. The ripeness and precision on the palate reflects the warmth of the 2017 vintage and the natural refinement inherent in Knoll’s wines. This will drink beautifully now, but will also reward those with the patience to cellar it for five to 10 years. Drink now to 2028.